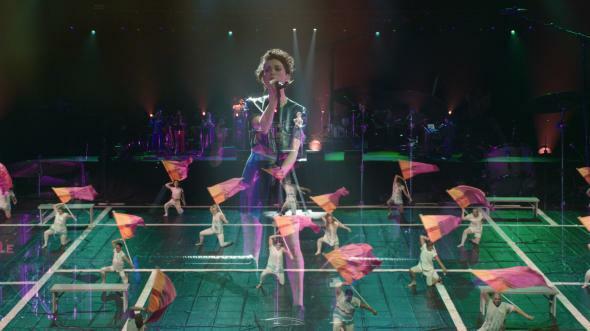 Contemporary Color, David Byrne’s tribute to color guard, documents a deeply queer artform. St. Vincent with color guard “Field of View” from Westchester, Pennsylvania. Coming up through my high school marching band program in South Carolina, I was always a little jealous of the color guard kids. A percussionist in the highly visible front ensemble, I sublimated my nascent gayness into the flashier aspects of performance: Hair glitter, overstated body language, a Michaels-worth of snow decorations when the season’s show was winter-themed. But while I was responsible for playing the marimba or crash cymbals, the guard members—with their flags, rifles, sabers, props, and dancing—had, to my mind, the superior expressive power. I think of one moment from another show (this one with Spanish vibes), where one of the lead guard men moved from a beautiful duet dance with embroidered shawls, to a harrowing saber toss landing on the downbeat of the next piece, to a mock bullfight over the course of a few minutes. I still hold my breath watching that toss on video today; like so much of what color guards do, it was a fantastic achievement of art and athleticism. And one that, given guard’s relative cultural obscurity, few would ever appreciate. David Byrne, the prolific musician and Talking Heads co-founder, was similarly impressed by color guard’s expressive potential, calling it “a sophisticated folk art form that flies under the official cultural radar.” So in the summer of 2015, he organized what has to be one of the more unlikely collaborative experiments in history. Ten high school color guards teamed up with ten composers to create pieces that would be performed not on football fields or in high school gymnasiums, but in New York’s Barclay’s Center and Toronto’s Air Canada Center in front of thousands. It was called Contemporary Color, and the composers included well-known acts like St. Vincent, Nelly Furtado, and tUnE-yArDs, as well as equally cool, if more niche, artists like the deliciously hipster team of Nico Muhly and Ira Glass. Lucky for us, the filmmakers Bill and Turner Ross were on hand to capture the event in a quirky, arresting documentary that’s rolling out in theaters across the country this March. I get that what’s essentially a concert doc about color guard is going to be a hard sell for many viewers, especially if your engagement with the “sport of the arts” has been limited to Fourth of July parades. But I urge you to give this film a chance. Instead of merely creating a recording of the event, the Ross brothers wanted to create something with more texture: “a kinetic portrait … a show in which anything, anywhere could happen at any time,” as they put it in a statement. In that spirit, the film conveys the meat of the performances themselves, but its focus just as often wanders away from the arena, to staging areas and dressing rooms, down hallways occupied by anxious parents and into control rooms manned by bored technicians. Contemporary Color’s most striking moments, in fact, might be when it leaves the event entirely: a young woman works her flag routine on the darkened street in front of her house; a man practices his dance choreography in the doorway of his garage. The overall effect of the Ross team’s approach is gently disjointed, like a dream—but the film isn’t overly oblique. A white-haired announcer straight out of Best in Show, just as often seen practicing his lines as delivering them, provides regular doses of humor. (When, in an ESPN baritone, he asks one young performer how he’s feeling after his piece, the man, streaked with makeup and sweat, imperiously responds: “I just had the best run of my life, so sorry I’m barely processing what you are saying right now.”) And the directors’ distractable eye actually has a way of drawing in snatches of backstory and narrative that a traditional concert doc would handle clumsily, if at all. You walk away with a sense of the incredible amount of effort and time that goes into creating these programs, a hint of which schools are wealthier than others, an appreciation of the role parents—especially gruff dads from places likes Mechanicsburg, PA—play in producing the artsy costumes and sets, and a glimpse of how mutually supportive and inclusive guard culture is, despite its culmination in annual competitions. But more than any of these details, I do not think you can leave Contemporary Color without understanding that color guard is deeply, wonderfully queer. It’s telling that the 2015 event happened on the same day that marriage equality won at the Supreme Court: The filmmakers capture a TV screen showing the White House lit up in rainbow hues, and Byrne, before his own performance, declares “Ladies and Gentlemen, America has changed.” But even without that bit of serendipity, the camera makes clear just by being on that this activity is a haven for queer people, especially young gay and bi men. During a backstage moment, we hear a woman explaining that “Most of these kids, you know, they’re not the prom queens.” But many of them are queens, and guard gives them both a venue for self-exploration and an alibi: Make-up, dance, and general exuberance might be dangerous in some of their communities, but in guard, it’s a requirement of the work. This is nothing short of a blessing—rare is the space in which queer/femme expression, especially among high schoolers, is a mark of competence rather than failure, a route to bonding rather than exclusion. And beyond the sexual and gender expression of the performers, there’s the queerness of the thing itself. The materials of color guard arise out of the military units tasked with guarding the colors. But here, they’re transformed from weapons of war into tools of art: Rifles punctuate rhythm instead of puncturing bodies, sabers cut only the air, and flags, normally dividers of space, now merely fill it with color. Because of guard, burly dads are conscripted to manifest the vision of show designers who want something “asylum-y, but vintage,” and across the country, sites of masculinist battle—football fields, basketball courts—are regularly occupied, if only for a few minutes, by an explosion of bodies working together not to assert dominance, but to create beauty. In the end, I think it’s the incredible, excessive amount of creative energy channeled into such an ephemeral, unlikely product that makes color guard feel so queer. A great deal of queer art is like this: effusions of aesthetic brilliance that exist for a few nights at some club or that screen in someone’s apartment for an audience of 10. Kudos to David Byrne for recognizing such a precious flash in guard, and to the Ross brothers for catching the shimmer for all of us to see.